We gave entered the business end of the VELUX EHF Champions League season, which means it is time to reward the competition’s best players with a nomination for the All-star Team vote. The European Handball Federation will run a public vote to select the most popular players of the season. For the first time this season, the nomination process has been opened up to a number of stakeholders. First to select their nominees are the coaches of this season’s group phase participants - one name for each of the playing positions plus the best defender, the best young player born in 1996 or later, and a fellow coach they value the most for his work in the current campaign. 24 of the competition’s 28 coaches submitted their votes and have been combined to produce the first batch of nominated players. Seven of the 10 nominees have progressed to the quarter-finals of Europe’s elite club competition, with Vardar and PSG leading the way with two names each, including Uwe Gensheimer, the only man on the list who was an all-star last season. Despite an exit at the Last 16 stage, Rhein-Neckar Löwen have two players selected, Andy Schmid and Jannik Kohlbacher, who struck up an incredible partnership in the centre of their side’s attack. Melvyn Richardson is the only representative of last season’s champions Montpellier, a bright spot in what was largely a disappointing and short-lived title defence. 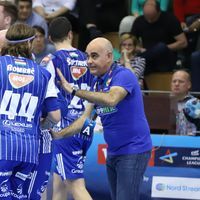 Having masterminded Szeged's remarkable run to the quarter-finals, Juan Carlos Pastor's efforts this season have been recognised by his fellow coaches. More nominees will follow in the upcoming days, provided by Forum Club Handball, an EHF Media panel, Faces of the Champions League and the EHF. The fan vote to determine the VELUX EHF Champions League All-star Team 2018/19 will start before the first leg of the quarter-finals and can be done via the new VELUX EHF FINAL4 app, which will be made available soon.